Driving under the influence charges in Overland Park are extremely serious matters requiring the guidance of an experienced Overland Park driving under the influence attorney. Recent changes to Kansas law, effective July 1, 2011 have drastically changed the laws regarding Overland Park drunk driving convictions and driver's license suspensions. Overland Park driving under the influence arrests lead to two proceedings which can drastically affect those charged with DUI. First, there is the criminal case in Overland Park Municipal Court where the penalties include mandatory jail time (even for first time offenders), fines starting at $750, and court ordered probation, treatment, and classes. 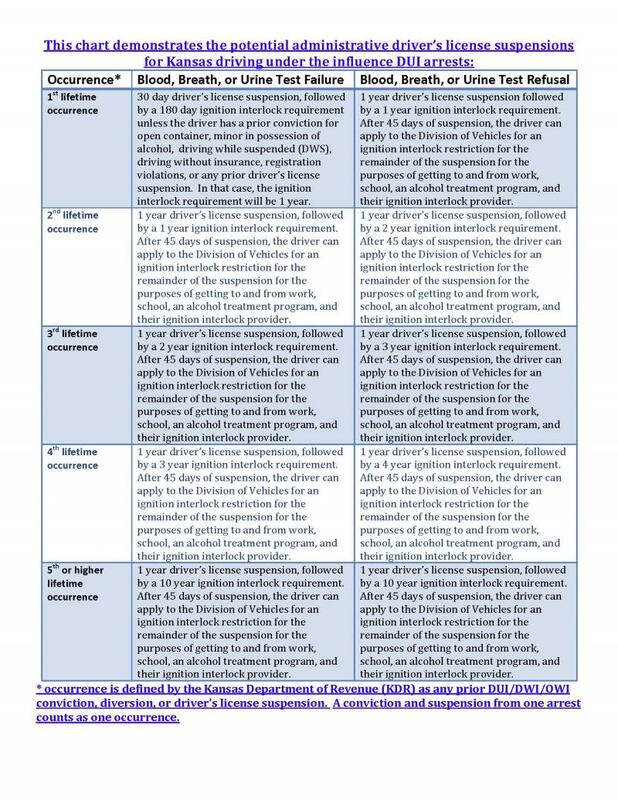 Second, there is the proposed driver's license suspension from the Kansas Department of Revenue. Called an "administrative driver's license suspension," this administrative hearing is separate from the case in Overland Park court. Mandatory jail time: The maximum penalty for a first time drunk driving conviction in Overland Park is 6 Months in the Johnson County Jail, with the minimum sentence being 48 hours in jail. Mandatory fine: The minimum fine for a Overland Park DUI conviction is $750, with a maximum fine of $1250. This is in addition to court costs, probation fees, urinealysis fees, and other costs. $1500-$2000 in total fines, fees, and costs is common in Overland Park. Probation terms: If probation is granted, the person will be required to meet with a probation officer, follow the terms of a drug and alcohol evaluation (formerly called an ADSAP, but the new DUI law changes this), take random urinalysis, attend weekend, weekly, or even daily alcohol/drug treatment classes, and avoid any new law violations. The probation terms will usually also require that the probationer avoid alcohol or drugs. In certain instances, our experienced DUI defense attorneys can arrange a diversion for Overland Park DUI charges. A diversion is a good way to avoid having a DUI conviction appear on your criminal history (although a diversion will not affect the driver's license administrative suspension). A diversion is essentially a contract we help arrange between you and the Overland Park prosecutor's office where you agree to stay out of trouble for 12 months, get a drug and alcohol evaluation (and follow the recommendations), pay ~$1600 in fines/fees/costs, and fulfill other obligations. Even if a diversion is completed successfully, it will still likely count as a prior conviction if the driver is ever charged with drunk driving again. Mandatory jail time for 2nd time Overland Park DUI-DWI convictions: The maximum penalty for a second time DUI/DWI conviction in Overland Park is 1 year in the Johnson County Jail, with the minimum sentence being 90 days in custody. Our law firm's experienced Overland Park DUI lawyers can often arrange for the 90 day minimum sentence to be served with 48 hours in jail, followed by 7 days of house arrest, with our DUI client being able to work while on house arrest. Our office's drunk driving defense attorneys can also arrange the Community Weekend Intervention Program (CWIPS) class which can allow our DUI/DWI clients to avoid jail time altogether. Mandatory fine for 2nd DUI convictions in Overland Park: The minimum fine for a second time Overland Park DUI conviction is $1250, with a maximum fine of $1750. This amount is in addition to court costs, probation fees, urinealysis fees, and other costs. $1500-$2000 in total fines, fees, and costs are normal in Overland Park Municipal Court on second time DUI convictions. Kansas law (K.S.A. 8-1567) makes a third DUI conviction a felony offense. Felonies must proceed in Johnson County District Court, which means that the normal procedure is for the prosecutor to dismiss the charge in Overland Park Municipal Court and send the case to Johnson County District Court to be refiled as a felony. Mandatory jail time for 3rd time Overland Park DUI-DWI convictions: The maximum penalty for a third time DUI/DWI conviction in Johnson County District Court is 1 year in the Johnson County Adult Detention Center, with the minimum sentence being 90 days in custody. Our law firm's experienced Overland Park DUI lawyers can often arrange for the 90 day minimum sentence to be served with a mix of jail time and house arrest or work release. Mandatory fine for 3rd DUI convictions in Johnson County District Court: The minimum fine for a third time Overland Park DUI conviction is $1750, with a maximum fine of $2750. This amount is in addition to court costs, probation fees, urinealysis fees, and other costs.